Drupal's menagerie of third-party and custom modules is a good example of when an unpredictable variety of components are added to a framework, and want to talk to each other while involving the framework core as little as possible. An example might be when a module saves a particular data structure into the database: it might want to inform other modules that it's about to do so, in case they need to modify it; and it might later want to inform them that it's saved, so they can react. At the same time, not every class in every module should have to be told. Also, the process of event propagation (notifying the next subscriber on the list, once the previous one has finished) needs to be stoppable, so that any one subscriber can step in first and terminate the response of all other subscribers. Drupal's historic method for implementing event-driven programming has been to use hooks (more on them in a moment), but since Drupal 8's adoption of Symfony components, it has begun to shift its event-driven burden onto Symfony's event system. 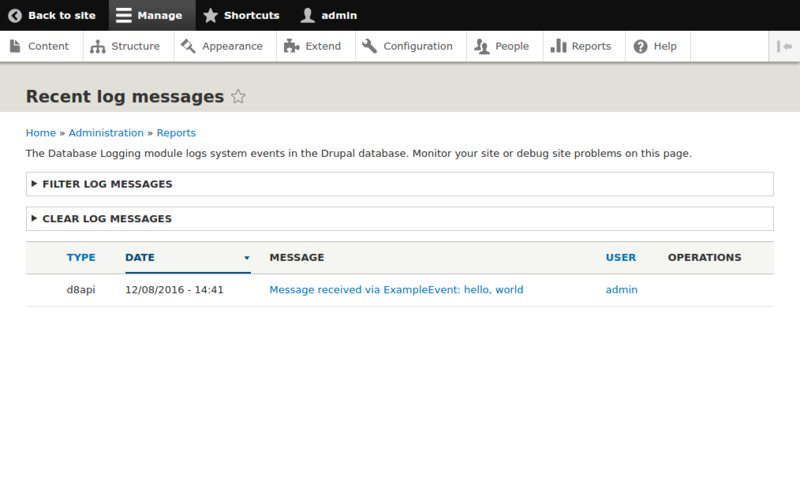 If you can find an existing event for your code to subscribe to, you can very quickly leverage that to have powerful effects throughout Drupal. Although we've generally avoided discussing "legacy" Drupal-isms in these blogposts, then even in Drupal 8 the hooks system is anything but legacy. Even now, the lifecycle of entities uses hooks to communicate. * D8API module: example only. * Hook for event "foo"
* Hook for event "bar"
The big strengths of hooks are: lightweightness; quick to write; and help encourage coding standards and naming conventions in older, non-OO PHP. The big disadvantage, along with pollution of the global namespace, is that they're largely undiscoverable: if you don't know the hook, you don't know how powerful Drupal can be. Along with robustness and maintenance improvements, this difficulty of discovering unknown hooks is why the move to Symfony events, while not yet complete, is a big improvement for Drupal. We don't discuss hooks any further here: along with a large amount of existing documentation for previous versions (at least some ten years of it, since Drupal 5.0), there's an open issue to expose existing hooks as a HookEvent in Drupal 8.3.x, which would mean that you could write almost all code using events rather than hooks. But it's important to be aware that hooks are very much still around for the time being. We're going to subscribe our custom code to an existing event, dispatched by core request/response handling; this code will then dispatch a custom event, which another part of our custom code will subscribe to and handle in order to log what's happened. To do this cleanly, we write the necessary code back-to-front, to avoid Drupal complaining about any of the classes being missing. *   Message provided via query string. *   Message set by constructor. The Symfony class is not abstract, so it needs no further methods. But we're going to use it to notify any subscribers to a particular event type, of a message which we don't want to be changed during event propagation: hence we set this protected $message during the constructor, then only provide a getter to retrieve it. 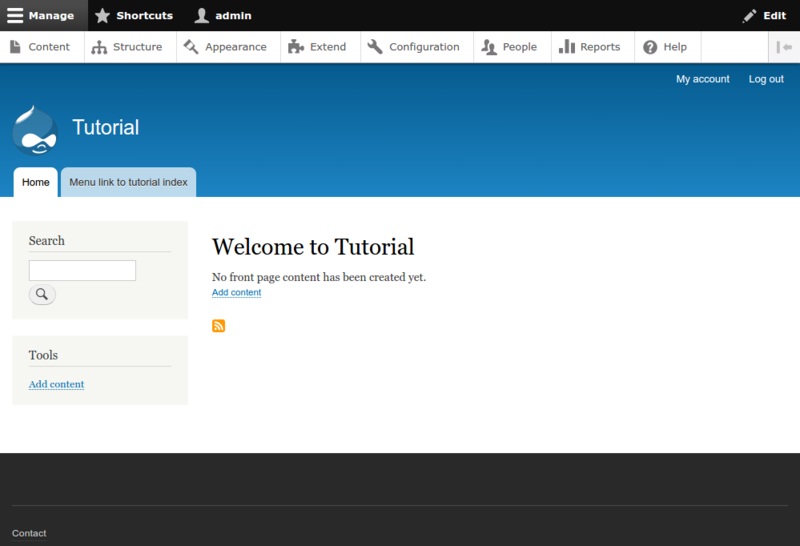 * Example event subscriber and dispatcher, all in one. *   Dispatcher provided by the factory injected below in the constructor. *   Logger provided by the factory injected below in the constructor. * Dependency injection defined in services.yml. // We inject logger factory, but only save custom channel in state. * Subscribed event callback: KernelEvents::REQUEST. * Look for the query parameter 'd8api' and log what it contains. *   An initially empty response event. // Set a response object with plain HTML. // Dispatch *another* event to log the message. * Subscribed event callback: ExampleEventSubscriber::REQUEST. * Log the message on the event. *   An example event, dispatched by the previous method. Rather than using a bare string, we define a class constant ExampleEventSubscriber::D8API. If you have a number of custom events, you should create an entirely new class to store them in, for tidiness and separation of concerns: for example, MigrateEvents in core. The protected variables and __construct() permit dependency injection, which has been discussed before. This permits the service configuration defined below to provide our custom code with both the event dispatcher service, and a logging factory service for connecting to new or existing logging channels. The getSubscribedEvents() method subscribes this object to two types of events: an in-Drupal event dispatched by the Symfony kernel when handling HTTP requests; and our custom event defined by our custom code here. These two handlers are registered in the interface method described previously, to handle the two events. The first handler creates a HTTP response based on the query string of the HTTP request, which prevents further propagation of the GetResponseEvent and returns to the browser; but not before it also dispatches a custom event using an ExampleEvent object; the second handler subscribes to this custom event, and just uses it as an example, to log the message from the HTTP request without actually touching any HTTP objects itself. Note that we inject a logger factory, but there's unfortunately no factory for Symfony Response objects, meaning we have to have one of the (rare) instances of the new keyword in our code. However, much of the event subscribers in Drupal core follow the same coding pattern, and Response is well tested and (assuming you don't explicitly call any send*() methods) have no side effects. The class above is intended as a simple example, which is why the same class is subscribing to and dispatching events, but you should be able to see how to apply this to a more complex situation. These five lines of YAML register our new subscriber class as a service, and tags it as an event_subscriber: all that's required for Symfony to investigate its subscriptions. 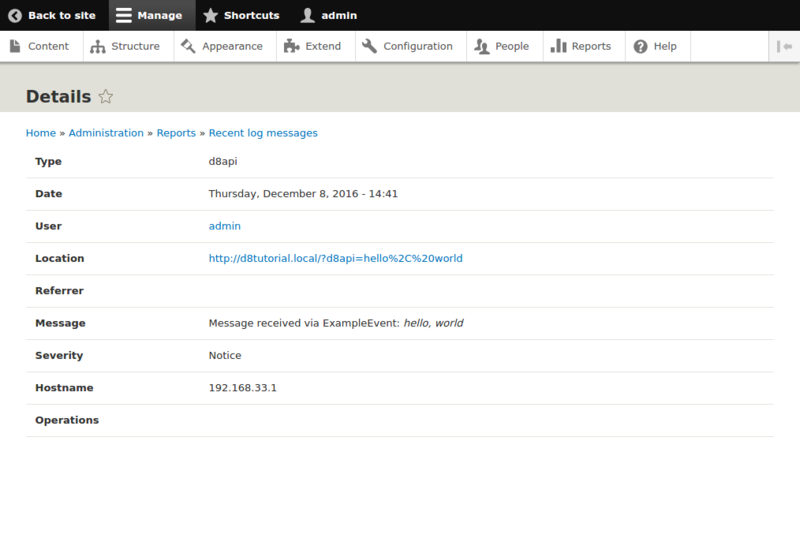 In addition, it also provides dependency injection of the event dispatcher and the logger. Because you've registered new services, you should clear caches with drush cr. As we've covered this a number of times before, we don't cover it here. This is because, while the GetResponseEvent is being passed to ExampleEventSubscriber::onRequest(), that code checks for the d8api= query string parameter, and returns silently if none is found. This is because the code is now providing GetResponseEvent with a Symfony HTTP Response, which terminates event propagation and indeed the rest of Drupal's response cycle. If you can see this, then congratulations! you have learned how to dispatch events, how to subscribe to them, and how to act on them when they're dispatched.